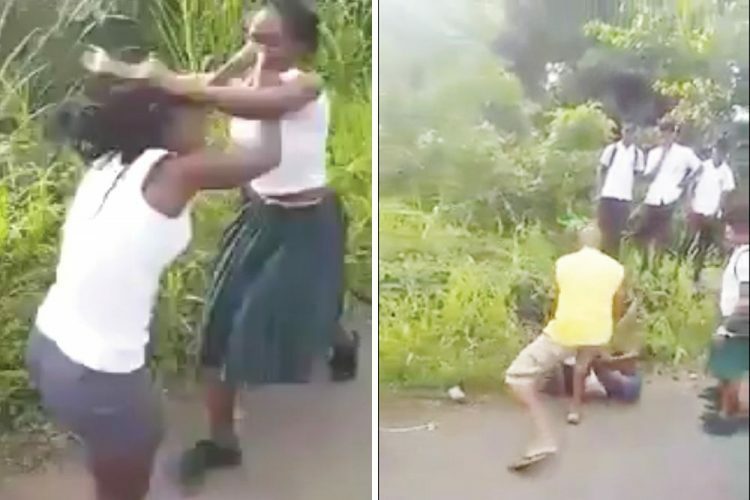 Persons on social media have expressed disgust at a video in which two secondary school-children were involved in a fist fight, while their schoolmates cheered on. The almost two-minute video, which surfaced on Facebook over the weekend, shows two female students of the Emmanuel High School Mesopotamia, swinging at each other. One female is seen being dragged by her hair and kicked multiple times, before removing her blouse and skirt and engaging the other female once again. However, this did not work to her advantage, as the other female, who had the upper hand throughout the fight, pushed her into some bushes and pinned her to the ground. The girl being beaten attempted what appeared to be a âtriangle chokeholdâ on the other student; however, it had no effect and it was not until an adult intervened that the fight came to a halt. Meanwhile, other students are heard clapping, laughing and cheering the fight on. Among persons to share the video on Facebook was Vincentian social media personality âJemrod Commessman News,â with the caption âSchool kids behavior much thanks to guy who part the fightâ. His video saw 43,000 views and 662 shares, with 200 plus comments. The additional comments represented the same message â that the fight went on too long and all students present should face disciplinary action.